It takes a lot of work to find work. Kate Gray knows that better than most. This summer, she spent her days handling many of the human resource duties at Project Footsteps in Minneapolis — coordinating volunteers, reviewing resumes, reading cover letters and setting up and conducting interviews with the people who created them. And this spring, she did the same thing, just from the other side of the desk. "When I was looking for an internship, I went to Mary Anderson in Career Services. We looked at internships together, worked on my resume and cover letter, went over interview tips," Gray said. "It's probably the reason I got an interview (at Project Footsteps) and eventually the internship." It's also the reason that she's considering a new career path — one in career services. Gray's career path has never been a straight one. 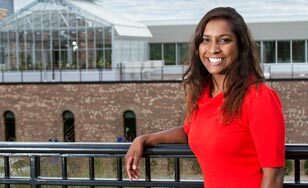 She attended a different college in the Twin Cities as an education major, transferred to CSS after her sophomore year to pursue a degree in Health Information Management and then, after a couple of years, decided it wasn't the right fit for her. So she set up a meeting with Career Services. "Other students I talked to had nothing but good things to say about their experiences with them, so it seemed like the place to go," Gray said. Together, Gray and Anderson set out to find a major that was a good fit with her personality and interests. They settled on a field that Gray had her eye on before — Organizational Behavior. "It's a blend of management and psychology, so you learn how to work with people, help them build off their strengths and develop their weaknesses and learn how to make organizations more efficient." Skills like this come in handy in any workplace. They certainly did at Project Footsteps. "The executive director of Project Footsteps told me that I'm like a chameleon," Gray said. "I can kind of go with whatever department he needs and fit in." Now she wants to help other students have the same sort of success as a career counselor. "I like the idea of being able to get to know a student on an individual level and learn about what inspires them, like Mary did with me," Gray said. "Our interactions had a big positive impact on me, and I want to have the same impact on others." She'll get the chance to test it out this fall as a jobs skills intern for Career Services. And after she graduates in December, she hopes to continue helping students with a job in Student Support Services before getting the master's degree she needs for a career in career counseling. And where will she go when she needs help with all that? "In Organizational Behavior I’ve explored how individuals, groups and systems influence behavior and learned a lot about about teamwork, leadership and effective communication. No matter what job you have, you are constantly working with a lot of different people. And I think organizational behavior has prepared me to do that. I love it." 97 percent of our undergraduate students are in a career field or a graduate program within six months of graduation. And Career Services is a big part of that success.